THE One Cebu party, led by its Cebu gubernatorial candidate Winston Garcia, has formally announced its support for Davao City Mayor Rodrigo Duterte's candidacy for president, vowing to deliver a one-million vote difference in the May elections. Garcia said the party reached its decision to throw its support behind Duterte after meeting with him late Saturday, during which it "became a logical and clear stand for One Cebu to support one of its own, and a Bisaya for President." "WinNer ta, Duterte pa," said Garcia, who stressed that the party made its decision to back Duterte, who traces his roots to Danao, after an extensive and thorough consultation with members and the burgeoning supporters of the party. "Kabahan na kayo," an ecstatic Duterte said, referring to his presidential rivals, after being informed of One Cebu's overwhelming decision to back him. Duterte has Senator Alan Peter Cayetano as his vice presidential running mate. Garcia said the Cebuanos will do for Duterte what it did in 2004. "History will repeat itself in this election," said Garcia, referring to the one-million vote difference the party delivered for the presidential winner of 2004. Garcia said One Cebu's platform, ideals and vision are in perfect sync with the Duterte-Cayetano's platform of government, especially on infrastructure. Cebu at present has 2.7 million registered voters. One Cebu earlier dropped Vice President Jejomar Binay as presidential candidate, saying that "UNA (Binay's party) treated One Cebu like imperial Manila treats the rest of the Philippines -- for all intents and purposes, with absolute contempt and disrespect." 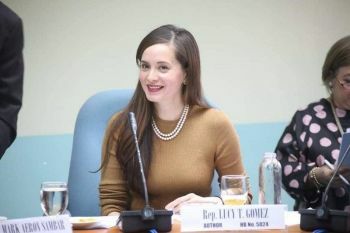 It turned out that the alliance with One Cebu is "nothing more than a marriage of convenience," thus the decision to sever its ties with UNA, said Garcia. Garcia said UNA repaid One Cebu's loyalty by "cavorting" with the opposition camps and by conducting sorties in the province without giving notice to One Cebu, causing confusion among its candidates and supporters. One Cebu threw its full support behind Duterte a day after the latter received the endorsement from the Zubiri family of Bukidnon. The unqualified support of One Cebu for Duterte is expected to significantly boost his presidential bid. This may turn out to be the start of a bandwagon effect, as other parties and politicians across the country may follow suit and switch loyalties and adopt him as their presidential candidate.